Last year I got a free L'Occitane Shea Hand Cream Hibiscus Flower with my Marie Claire and I was instantly smitten with the wonderful quality of the product. 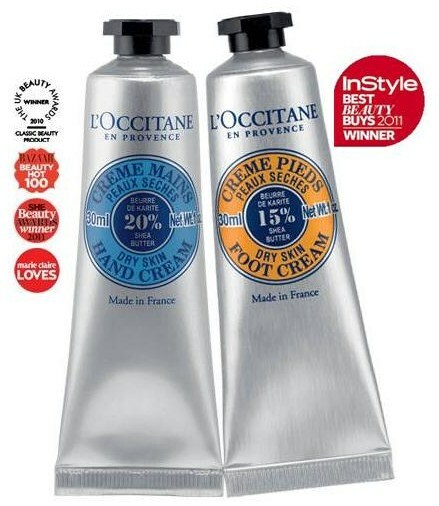 For Christmas, my boyfriend gave me this hand and foot cream duo and I have been a huge L'Occitane fan ever since. The hand cream makes your hands feel soft and smooth instantly and it has a lovely, subtle smell of shea butter to it. The foot cream smells of lavender and moisturises instantly. Neither one of them is sticky or greasy despite the great effectiveness. I keep my set on my bedside table at all times and can't imagine life without them any more. You can get 2 x 30ml for £15.50 (ideal for the handbag or as a trial set) or 2 x 150ml for £36. I realise that they may be a little on the expensive side, but not only are they of a wonderful quality, the little tubes they come in look great too. Look What Arrived in the Post!!! Is this cute or what...?! !